But what is the last stat (the one with the value of 899)? What stat is that? While at it, what does flipped V and that rotated Omega sign means? 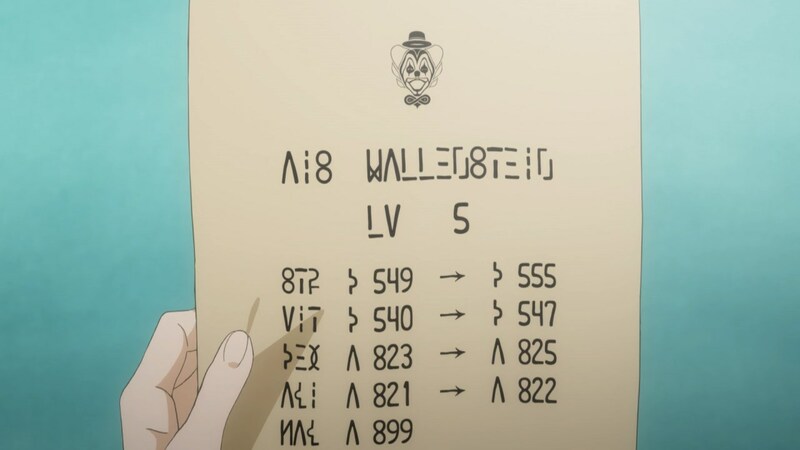 Considering that the same symbol is used in her name, the flipped V must be A, which I believe is her stat's rank. But what about the other one? The last two letters of the last stat looks like 'ag', as they start with the same letters as 'agi'. Without knowing the Anime we know that it can then be one of; Bag, Cag, Fag, Hag, Jag, Kag, Mag, Oag, Pag, Qag, Uag, Yag, or Zag. However looking online, it seems the last stat type is 'magic' and so it's probably 'mag'. The two symbols next to the ranks if using the same letter system would be a D for; Str, and Vit, as they're between 500-599, and a A for; Dex, Agi, and Mag, as they're between 800-899. Which seems to correlate with the earlier link. The letters are obviously English using a made up script, so a simple substitution can help us figure it out. You can tell that the second and third letters are the same as the first and second letters of AGI (for agility), leaving us with _AG, eliminating all the already existing letters leaves us with BCFHJKMOPQUVYZ - trying each of these. The only thing that makes sense is MAG, for magic.